Staggering Amount of Chemicals Entering Great Lakes—Do You Buy Products that Threaten Drinking Water? This article by the Alliance for the Great Lakes is re-posted from Ecowatch. The Great Lakes are home to 20 percent of the world’s surface freshwater and, increasingly, host to a worrisome class of chemical compounds known as contaminants of emerging concern. Often originating from everyday products ranging from shampoos and pharmaceuticals to textiles and home furnishings, as well as from common agricultural practices around the Midwest, these compounds can have impacts on people and wildlife that are far from benign and are raising concerns about their effects on the body’s endocrine system—the driver of key functions such as growth and development, metabolism and reproduction. A report released today by the Alliance for the Great Lakes notes that since the production of synthetic chemicals took off after World War II, the waters of Lake Michigan—which take a century to refresh—have yet to see a complete turnover. Halfway through this cycle, scientists are beginning to see alarming trends of an increasing multitude of chemicals found in the water. In southern Lake Michigan, one of the most urbanized and industrialized areas in the Great Lakes Basin and home to approximately a third of the Great Lakes population, these contaminants are a steady source of chemical exposure for aquatic species, and affect the quality of the waters we rely upon for drinking and look to for recreation. “The number of chemicals entering the nation’s environment each year is staggering, as is the potential for them to degrade the water we drink and swim in,” says Alliance President and CEO Joel Brammeier. Upwards of 85,000 chemicals are in production and use in the U.S. today—more than 2,200 of them produced at a rate of 1 million-plus pounds a year. Beyond this, consumers can choose from more than 50,000 pharmaceutical products, and nearly 20,000 registered pesticide products have entered the market since registration began in 1947. The report applies a published, peer-reviewed scientific framework to rank chemicals of highest concern found in national waters that are representative of those found in the Great Lakes. The methodology examines both surface water and treated drinking water—identifying the top 20 emerging contaminants for each based on occurrence, ecologic and human health impacts, and water treatment capabilities. The top-ranking chemicals include representatives from a broad range of categories: hormones, synthetic musks, antibiotics, pharmaceuticals, antimicrobials and preservatives, UV blockers, plasticizers, flame retardants and pesticides. As the chemical presence around us expands, the potential for them to end up in the Great Lakes also grows—arriving there via atmospheric deposition, stormwater runoff and sewage overflows. Others are released into the Great Lakes at trace concentrations via treated wastewater discharges because conventional sewage treatment isn’t designed to remove them. Lake Michigan’s surface waters are affected, with six of the top 20 chemicals detected—among them flame retardants, synthetic fragrances, bisphenol A (BPA), and a popular cholesterol-lowering drug—found in the open lake waters. Current data shows that, after processing in a treatment plant, drinking water drawn from Lake Michigan may not be significantly burdened with contaminants, with only one chemical—a flame retardant—detected of the top 20 identified in the report. The report cautions that the data collected thus far provides only a snapshot of what might be in the open waters of the Great Lakes, however, and doesn’t take into account the health risks that bioaccumulating chemicals in the water pose to people who eat Great Lakes fish. Also not known is the level of risk these trace levels of contaminants in the water actually pose for people and wildlife. 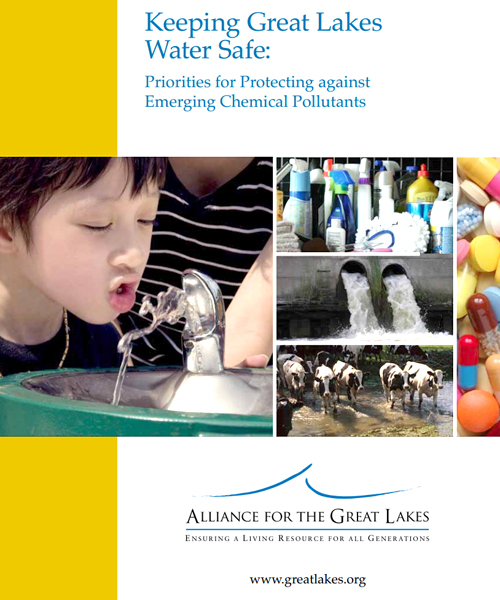 “With hundreds of mostly unregulated compounds detected in Great Lakes surface waters today, it’s critical to start identifying now those chemicals that pose the greatest threat to the health of the lakes, the wildlife and the 40 million people who depend on them for drinking water,” says Olga Lyandres, Alliance research manager and author of the report. Some municipalities and public utilities already monitor or study emerging contaminants, among them Chicago, Milwaukee and the Central Lake County Joint Action Water Agency—which supplies drinking water to Lake Michigan communities in northern Illinois. But many smaller communities, such as Gary, Ind. and Racine, Wis., don’t monitor for them because of the absence of clear guidance on how to do so. Although water treatment plays a key role in removing contaminants, the report emphasizes that water and wastewater utilities are not solely responsible for preventing and controlling contaminants in Great Lakes water. To that end, it calls for a comprehensive approach that involves not only technological solutions, but collaboration among utilities, regulatory agencies, public health officials, manufacturers and environmentalists to focus on pollution prevention. Funding development of consistent, uniform regional monitoring standards. Encouraging the U.S. and Canada to draw on credible prioritization methods to set binational objectives for controlling high-priority Great Lakes contaminants, and to pursue these goals through domestic policy reforms. Reforming the 36-year-old federal Toxic Substances Control Act to feature a framework that places pollution prevention at the forefront of new chemical design and production.